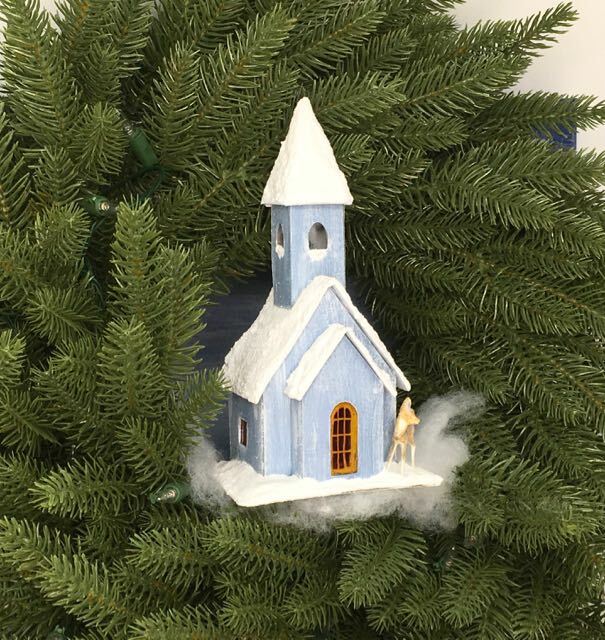 Snowy Christmas Church in a Christmas wreath. It’s 10th in the 12 Houses for Christmas series. 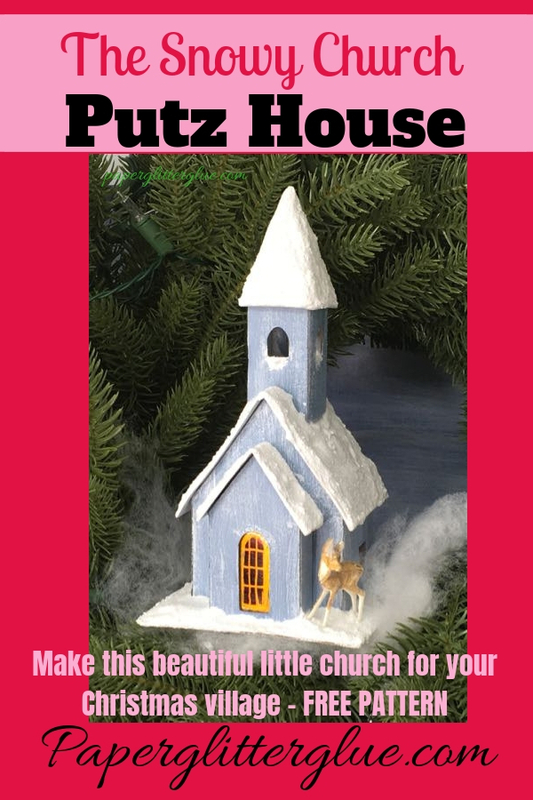 Just finished the latest Christmas Putz house – the Snowy Church. 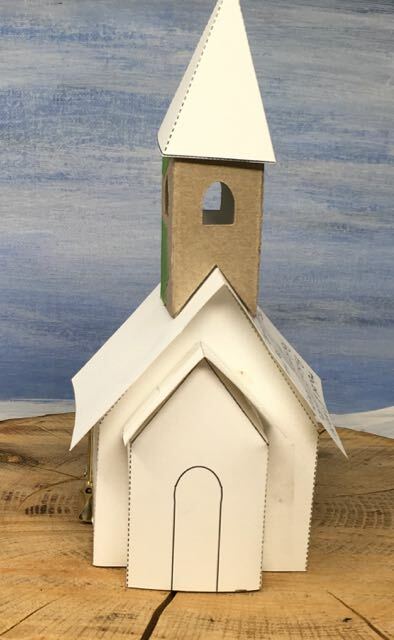 It’s a small church 2.5 inches wide and 2.5 inches deep with a snowy roof – hence the name, of course. But it is 7 inches tall. I didn’t really mean for it to be that tall, but that’s what worked with the proportions. If I use it on my Christmas wreath it will have to a centerpiece, I think. 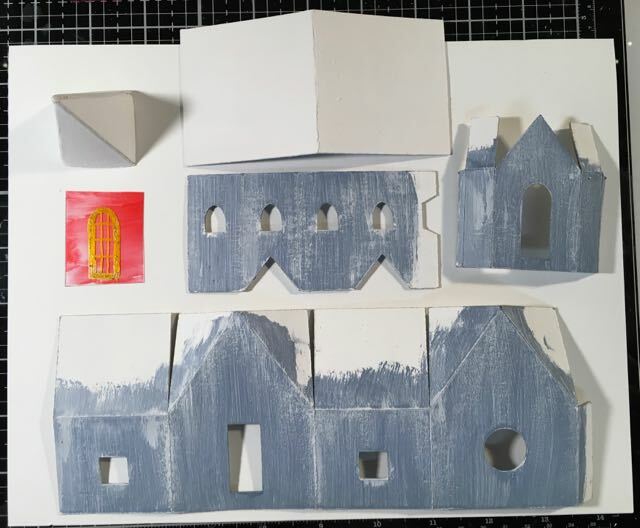 We’ll see in a couple of days when I finish the 12 Houses for Christmas challenge. Here are most of the little houses completed so far. What is your favorite? 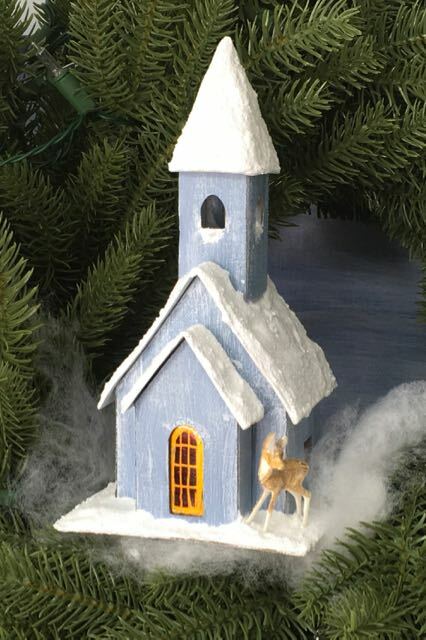 Where to get the free printable template for this little Snowy Church? 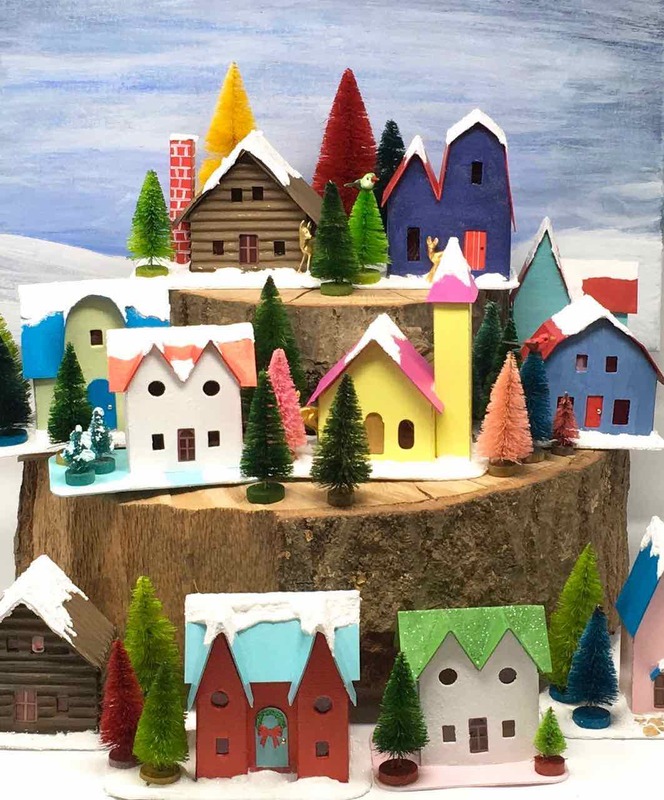 You can get the free pattern to make this little village in the Paper Glitter Glue Library. Just subscribe to my newsletter with the form below if you haven’t already done so and you’ll get the password right away. Then you will have access to all of my patterns – I think it’s over 30 patterns now. And I add new ones all the time. There are 2 files for this particular pattern – a PDF and a SVG file saved in a Zip folder in the Paper Glitter Glue library. The SVG file was kindly corrected by Jennifer Maker, an amazing crafter. 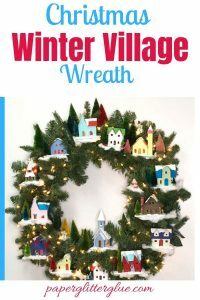 Be sure to check out her blog because what she makes will astound you. Thank you so much, Jennifer. In the library you will find the patterns added chronologically with the most recent file at the top. First I’d like to show you some design challenges. Figuring out the proportions for the steeple took a little while. The first steeple was too fat and chunky. The second steeple was better but too short. And the third steeple – just right. 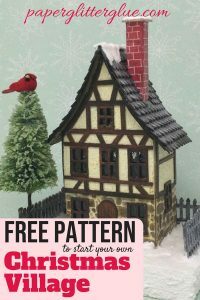 In addition to the too chunky steeple, you can also see the notes I made on changing the pattern. The first church itself was about 1/2 inch taller, but that doesn’t fit well with the other little houses for the Christmas village. 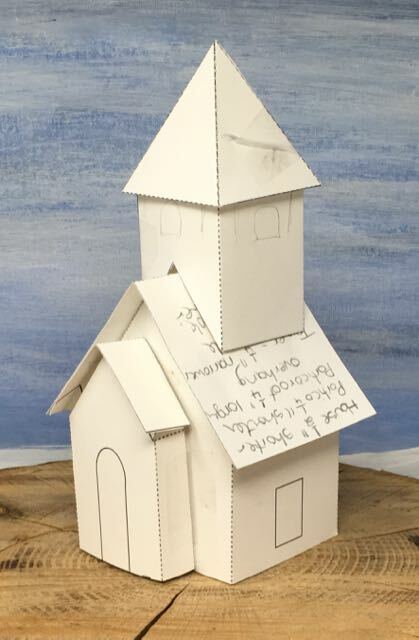 After the too chunky steeple, I made a better design, but I think the steeple is just a little too short compared to the body of the church. Better design, but still the pattern needs a little tweaking. 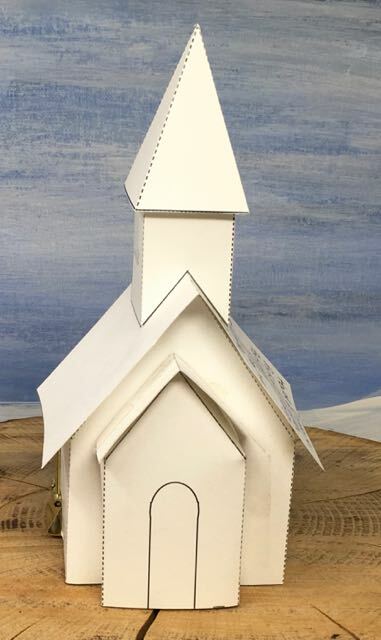 Here’s the paper pattern taped together to test the third steeple design. The steeple is tilted at a jaunty angle. 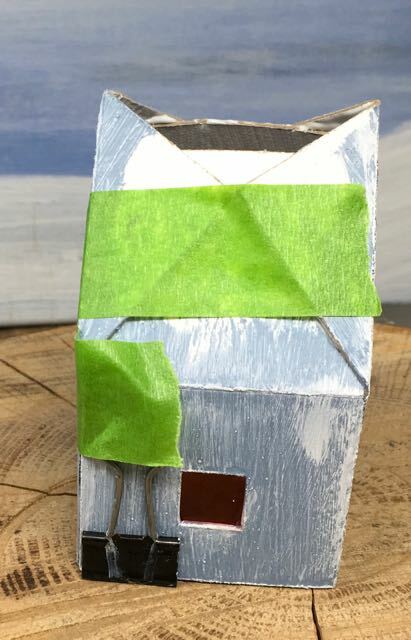 But I glued it on right on the final house. 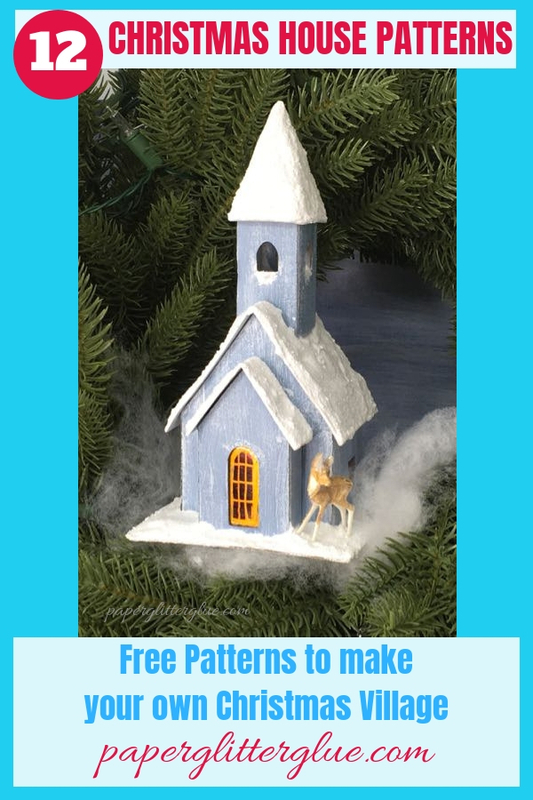 Download the Snowy Church paper pattern. 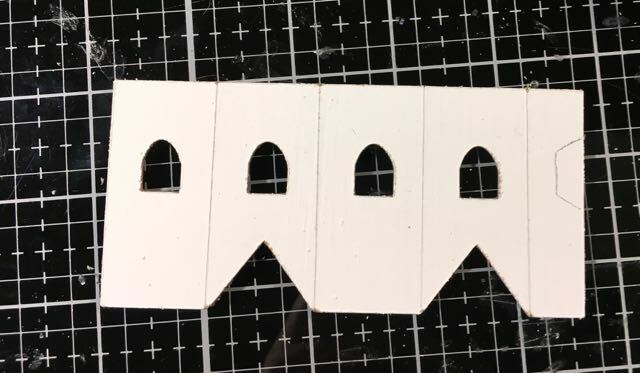 If you cut by hand which is what I usually do, then print out the pattern and trace it onto your cardboard but whatever method works for you. Usually I use tracing paper and a stylus to trace the pattern onto my cardboard. 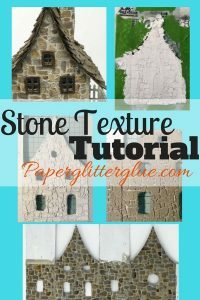 Cut the pattern out using your cutting machine or by hand. On the church I cut out on my Cricut Explore I still had to score the lines because they weren’t deep enough. Probably it’s due to user error, but I am learning. 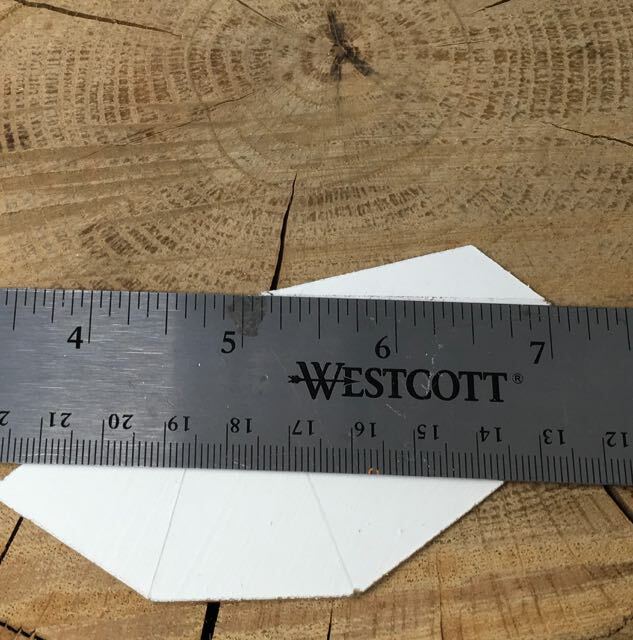 Use your metal edged ruler for scoring. And I even use it for folding to make sure I make a nice straight fold in the cardboard. Trim the steeple pattern just a little bit. Oh, there is one thing you will have to cut out that I left off the pattern. I didn’t realize that the glue tab for the steeple would overlap one of the windows. So cut out a small wedge to make sure the tab doesn’t overlap the windows. 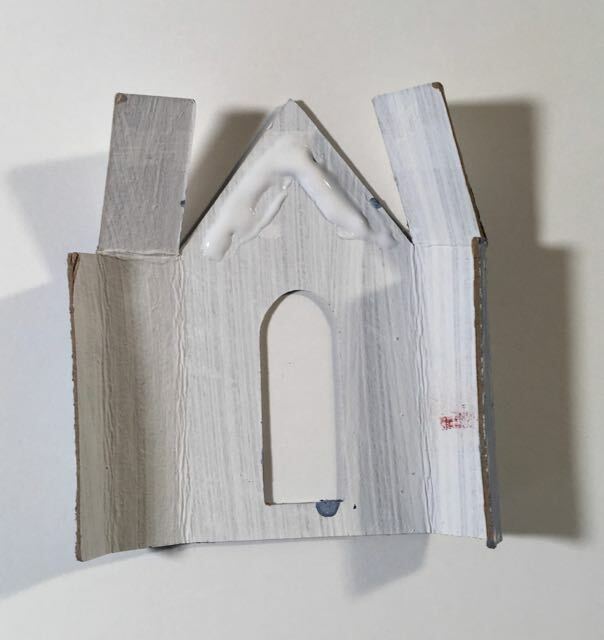 Here is the little excess cardboard on the glue tab that overlaps one of the steeple tower windows. Paint your little church in whatever colors appeal to you. The previous little church was painted with Squeezed Lemonade yellow and Picked Raspberry to make a Raspberry Lemonade church. 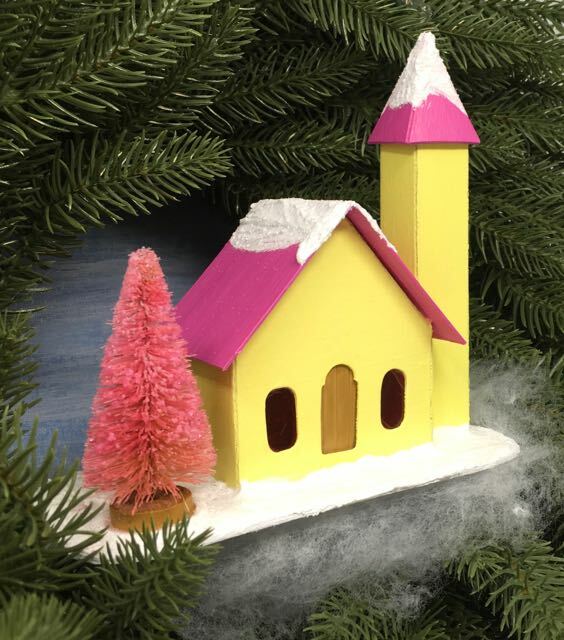 A little Putz church with a side steeple and a pink bottlebrush trees. 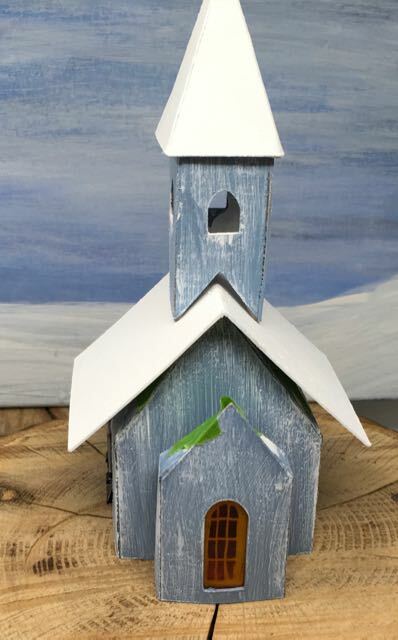 For this church I painted it a dusty blue distress paint shade called Stormy Sky. It is exactly what I wanted. Yep. They’re going to fit fine. To make the door you see above, I drew it on the back of a piece of acetate stained with red alcohol ink. The best pen I know of to make something like this is made by Uniball. It smeared a little bit on my test door so I made sure the side I wrote on was glued on the inside of the house so it wouldn’t smear. First I traced the door outline on a piece of paper. 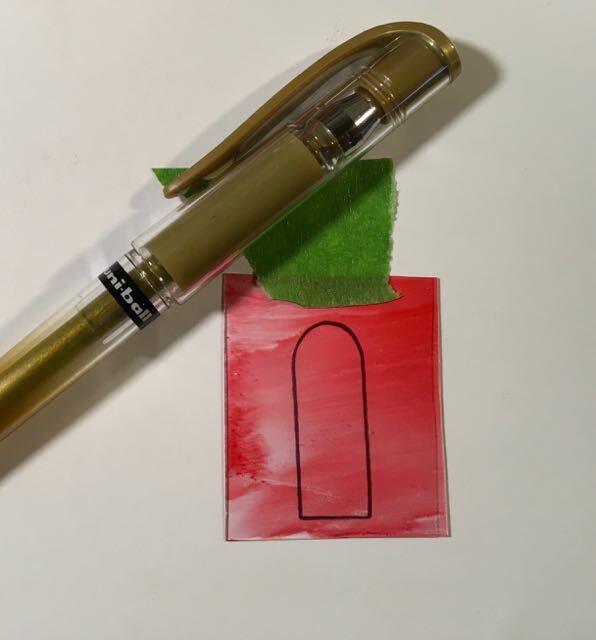 Then I used a gold pen to draw the door on a piece of acetate plastic. Now glue the doors and windows on the back of the house. My favorite glue for this step is called Glossy Accents. It’s my favorite because it dries quickly and adheres really well – even glues non-porous materials like acetate to cardboard well. Here’s a trick for the front church portico. That line of glue is to hold the roof flaps in place and then steady the front gable. Glue down those roof flaps. Now glue all the roofs down. Painter’s tape helps a lot. 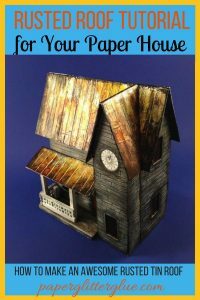 After your house is completely assembled, glue your house to its cardboard base. 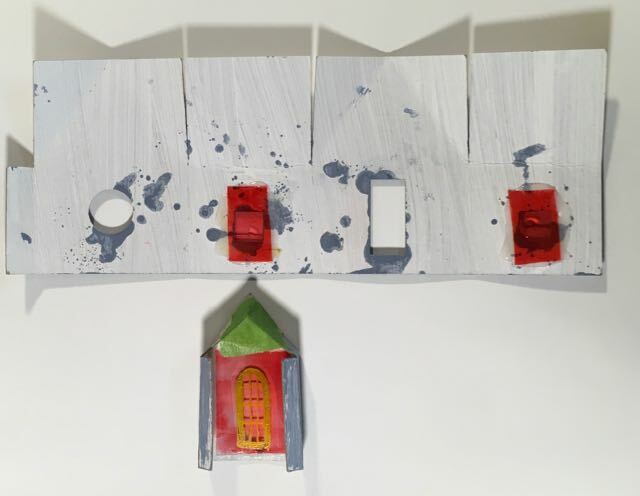 For these houses the cardboard base is just two layers of cardboard glued together. The glittered deer is always looking about and ready to run if need be. I love snow. I’ve always lived in the South where snow is a rare and delightful treat. It means days off from school (but not work – I work in the emergency department. We don’t ever get off for stuff like that). But it still makes me happy to see snow. So I decided to totally cover the roof with snow and glitter. Also because the house is relatively big compared to the other houses in this series, I made the base very small, only a little larger than the house itself. That means I only had a tiny space for Christmas embellishments. Guess what I chose? Yep. The little deer. Only this time I glittered the deer. 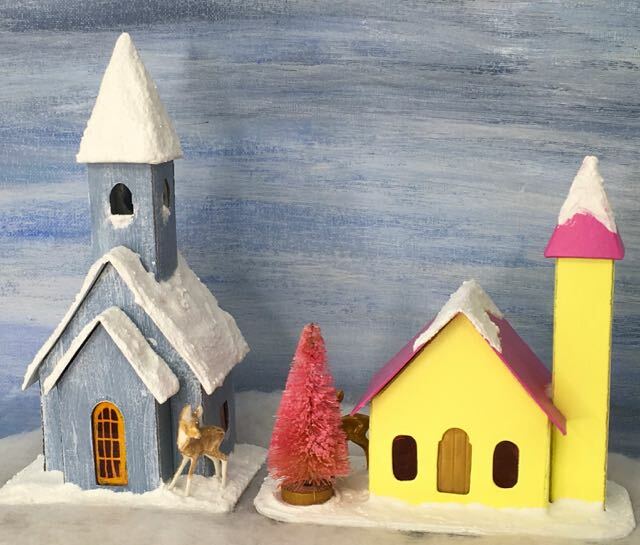 Two little snowy roof putz house churches to decorate a Christmas village. I got better at applying snow. Hum! The sky looks like it might snow. So that’s it for the Snowy Church which is the 10th house in the 12 Houses for Christmas series. Only two more houses to go. What’s next? You’ll have to wait until tomorrow to find out. Questions? Comments? Leave a comment here or email me at Lucy@paperglitterglue.com so I can help. 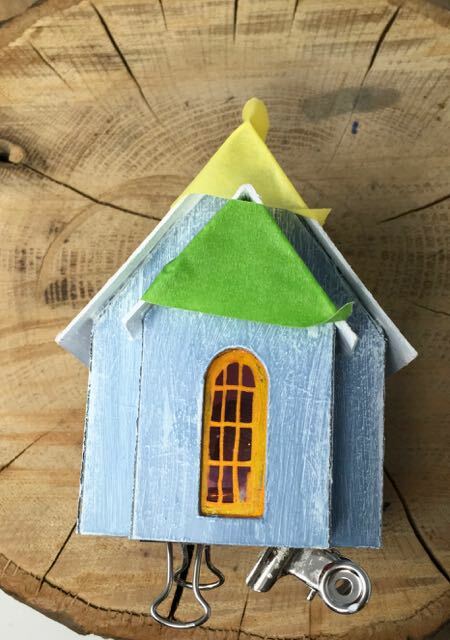 Hi, love the little houses and have all of the first 10 ready to go. 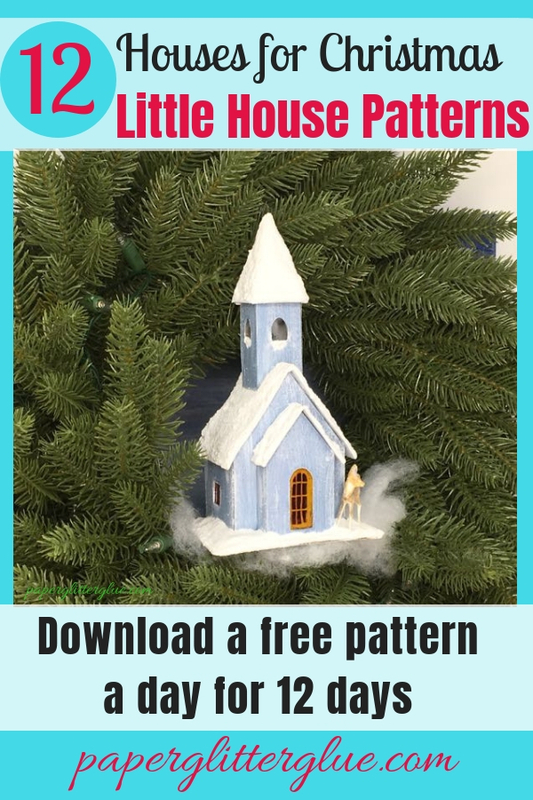 For some reason the 11th house, the steeple church, will not allow me to see or print the pattern. The files for that one in the library will not open on my computer. Haven’t had any problems with the others so I’m at a loss as to what is wrong. Any ideas?? P.S. It really helps me and other people,too that you let me know about these problems. Thank you. Judith, I think I have a PDF version that will download and print easily for you. Again, let me know if you have any problems. I love Xmas decorations and my family is always looking for ways to make every year a different one. This is the right time to try this beautiful snowy church and I know my family will love it. I really like how you fully explain everything, including the challenges you face while designing Putzes and how you overcome them. Thanks for this very helpful info! Thank you, Bonnie! I try to inspire and really help people so they can make the best little house possible. I made this as my second Cricut Maker’s project. The first one I didn’t quite catch on but the second one was good enough to give to a friend. It reminded me of the punch out books when I was a kid (1950’s, 1960’s) and was just as satisfying. I loved those books! My friend loved her little snowy church. I’m looking forward to making more. Thank you!